A stack of artist monographs lie heavy on the left side of one of Los Angeles based painter Hilary Pecis’ compositions, the titles running the gamut of painters from Fairfield Porter and Florine Stettheimer to Kerry James Marshall and Henri Rousseau–lovingly depicted in the artist’s confident hand. Beside them sits a ceramic vase with lilies overflowing, the discerning eye realizing that the vase is an original piece by the funk-art legend Maija Peeples-Bright, with a painting in the background alluding to yet another artist that has played a role in Pecis’ life and development as a painter. 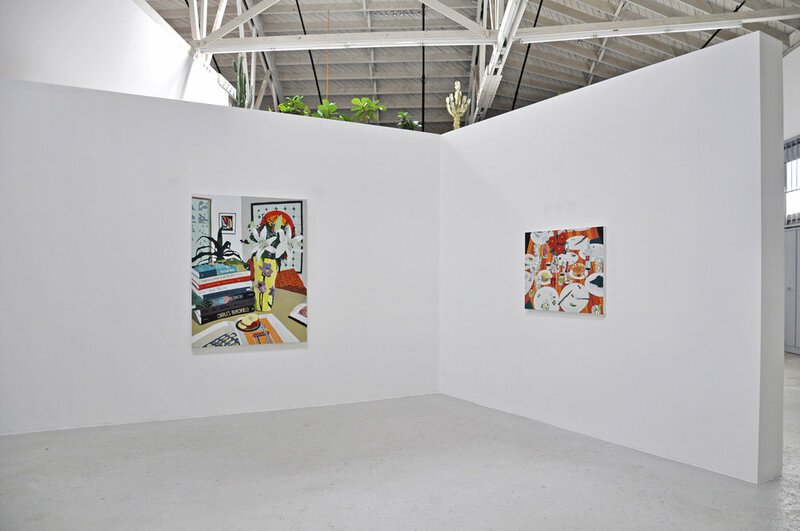 These are self portraits made in remove, works that both intimately invite you into the home and spaces around LA and California that the artist visits, as well as puzzle pieces through which we construct a fuller understanding of the artist as we stroll from work to work. 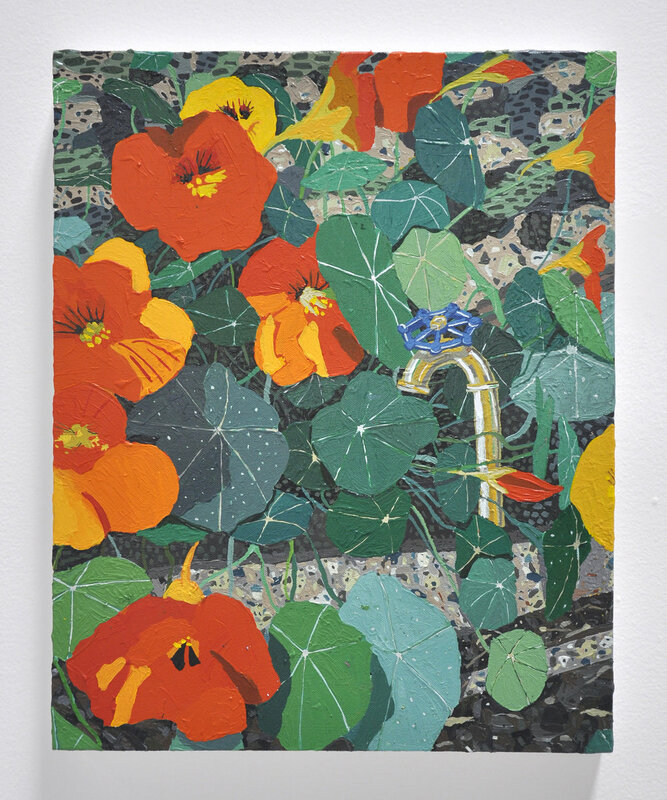 Pecis’ paintings within Familiar Views feel both rooted within the history of painting, of the still-life and landscape traditions in particular, and emblematic of the contemporary space which painting holds. 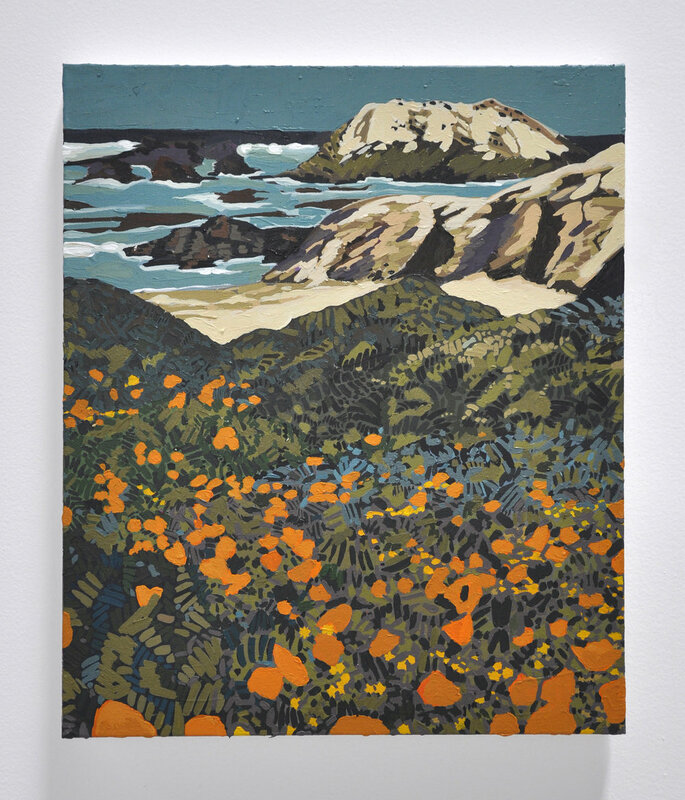 The classical techniques of intense rendering and lush blends of oil paint are traded for Pecis’ textural and flattened compositions and a penchant for odd perspectives, translated through the artist’s handling of her favorite local acrylic paint manufacturer: Novavcolor. 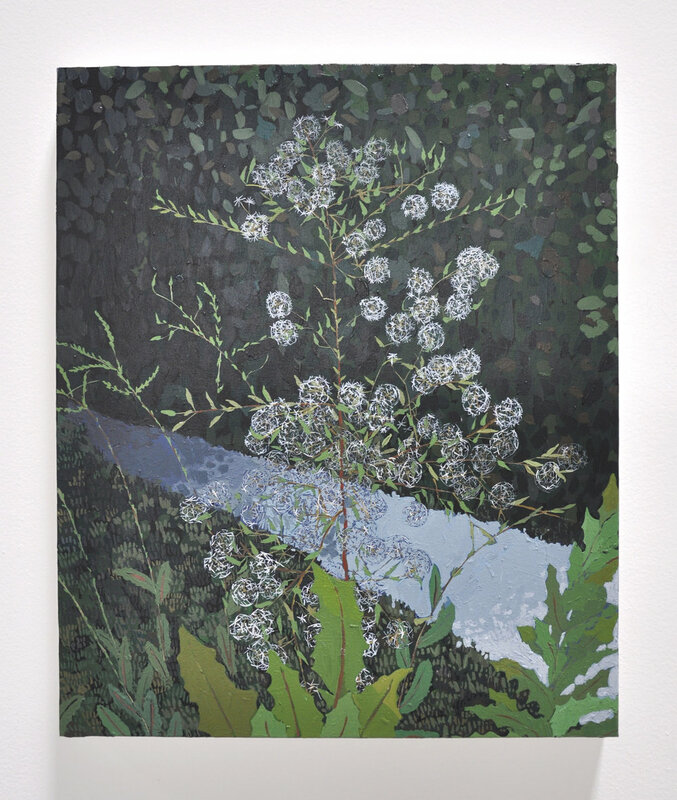 Much like their art historical connotations, there’s an ever-present layering in Hilary’s works, of experiences, of references, of objects and space––a casual density found throughout the works in her solo exhibition, regardless of content or location. 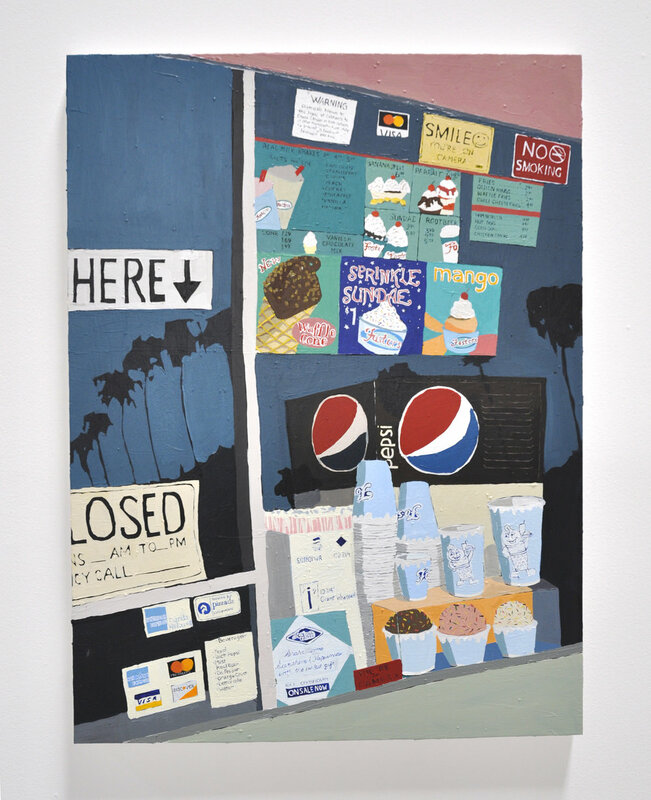 The paintings bounce fluidly from domestic spaces and the artist’s garden, to desserts and the jagged mountains that surround LA, and back to the scenes that feel archetypally of Southern California–low slung markets, aging signage, and of course the ever-present hovering palm tree. Regardless of the space inhabited by the painter’s gaze, there lies an overarching feeling of comfort–of being invited into the artist’s home or following along on the family’s travels. And at a time in which social media beckons its users to actively package their lifestyles and “live” exciting experiences for the vicarious consumption of others, there lies an alluring and sincere confidence conveyed in Pecis’ invitation to inhabit some of the quieter moments in the artist’s life.